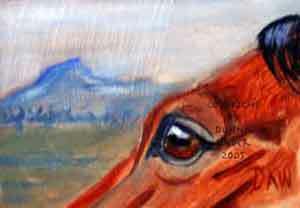 The following articles are by the very talented Equine Artist Donna Ridgway. Even if you are not interested in producing Equine Art, you will still find this series of articles interesting and informative. If you enjoy this information, please do take a moment to drop Donna an email and let her know. Be sure to also visit her website and check out her awesome artwork. The first things you need to know about becoming an equine artist are some basic rules about image use. As an artist you must learn to work using live subjects, capturing your scenes, or using a camera to take your own photos. Your unique way of seeing the world of the horse shines through when you use your own reference materials. Another way to create an image, is to call upon your imagination. Let it flow and see what appears on the canvas or paper. Artist’s also find images, by purchasing the rights to photos or pictures that belong to someone else. It’s perfectly acceptable and legal to use images if you purchase rights. You may also ask permission when you find a photo you like, some people will allow you to use their photos for free. Becoming a member of certain organizations and contributing to their member reference libraries gives you the right to use other members reference photos. 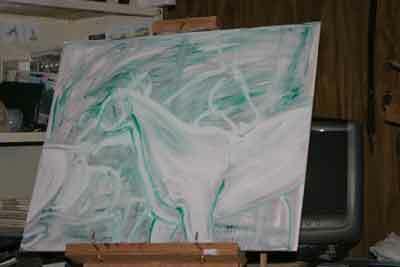 Two such art related organizations are the Equine Art Guild and Wet Canvas. There are other sites on the web, where you can receive help in your quest for learning to paint, these two above, happen to be the two I belong to at this time. At both organizations, you’ll have help with any problem that arises. Artists there are happy to assist you with information about supplies, mediums, techniques and encouragement. 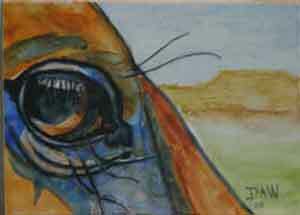 There’s a fee to join the Equine Art Guild, Wet Canvas is free at this time. Both organizations accept you at the skill level with which you paint at this time. You don’t have to be famous or skilled to join. If you choose to paint human subjects with famous horses, be sure to obtain a model release. 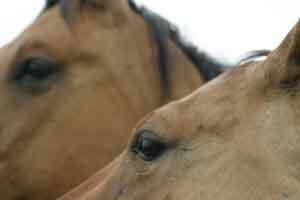 Images of some people and horses are legally protected against use. It’s wise to ask permission before you begin to paint these subjects. Copyright law might seem complicated. It becomes very simple if you remember this basic rule. Don’t copy another person’s work. Use your own reference materials! You’ll hear from some sources it’s permissible to copy a work if you “change it 10%”. Don’t do it. It isn’t legal. Use your own materials! I can’t stress this enough. Think of it this way, would you want someone else copying your work? You won’t be considered a serious artist, if you don’t gather your own sources for your work. You don’t have to own a horse to become a great equine artist. Perhaps you work with horses and have endless ideas coming your way for your art. 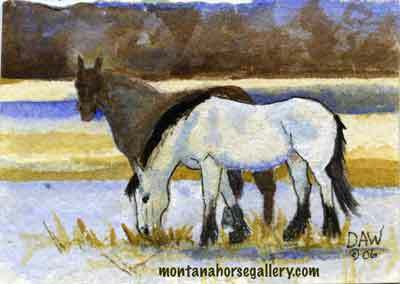 Many artists I know go to the track, parades, rodeos or other equine events to gather material for creating their paintings. 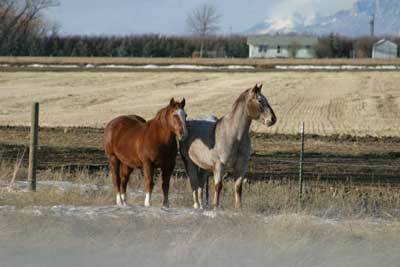 Perhaps you have a friend or neighbor who’s willing to allow you to photograph their horses. I like to drive around the countryside taking photos of horses I find along the way. I’m careful not to disturb the horses or try to get close to them, I take the photos from a distance. This method gives me natural looking poses of horses in their environment. 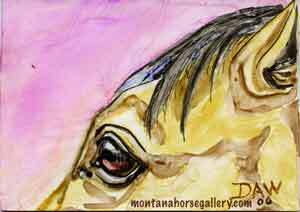 Many factors enter into becoming an equine artist. First and foremost, is the image you create and how you come upon it. 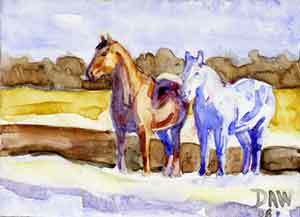 In the following articles, I’ll post lessons, with examples, on how to draw and paint horses. The support is what you actually paint upon. Some artists use prepared canvases. You can purchase them in online stores, craft stores in your town, and from art supply catalogs. If you want longevity in your work, use the good, stretched canvases. They come on wooden stretcher bars. For practice, the canvas boards are fine. Gallery wrapped canvases are wonderful as they don’t require framing! As soon as your painting is finished, it’s ready to hang on the wall. Other artists prefer to use mdf board or masonite boards. Unless you’re planning on doing very large paintings, 1/4 inch board will work for you. Lumber yards will cut 4X8 sheets of this board into sizes you require. They usually charge a small fee for this. You can also cut your own boards if you have the tools. If you want to get extremely creative and find your board at the best possible price, (which is free) find a friend who has a cabinet shop, a contractor, or woodworker who throws the scraps away. They’ll be happy to have you pick the scraps up so they don’t have to haul them off. You’ll also find this material in dumpsters where general contractors have thrown excess materials away. Choose only the good fresh boards that are clean. Once you’ve acquired your board and cut it to size, it needs to have a coat of gesso. Gesso is a special kind of paint that covers boards, sticking to them and giving you a safe surface to apply your paints. I use several coats of gesso on my boards. (4-6 coats) I paint both sides so the boards don’t warp. Some artists like to sand between the coats of gesso to get a smooth surface. (Let it dry thoroughly between coats.) I like the texture of my lines and lumps to show through, so I tend to slap the gesso on with abandon. Many artists use house paint or primer for this application. There are pros and cons to this line of thought. You might want to do more research on this method and decide for yourself which way to go. I’ve done it both ways and it hasn’t seemed to make much difference. You can also gesso mat board and other surfaces before you paint on them. Don’t be afraid to try new things. If you watch House and Garden television, you’ll see how any surface can be painted! A word of caution. To create fine art, use only the best methods, materials and preparations. For other painting, you can get as creative as you wish. 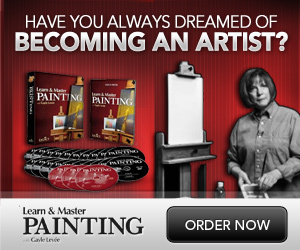 This is the easiest, fastest way to begin painting. Place your primed or gessoed support flat on a table. Dip a large round oil painting brush in your turpentine or odorless thinner. Dip your brush into any color of paint on your palette. I like to use colors that will be complimentary to major colors in the painting. This gives the painting a glow you don’t achieve otherwise. Smear the paint and turpentine around the canvas. Your goal is to cover the support with some color. You want this color to be loose and what a painter will call “washy”. The color doesn’t need to be dark. While I’m finding my image on the board, I’m constantly thinking. How far away from the edge should this line be? How does this shape curve? Where does it meet the next shape? Is this line half way across the painting horizontally? Where does it cross this vertical line? You can see in the image above, you might call this a complicated painting. It really isn’t. While you’re drawing, never think about horses. Don’t say to yourself, is this horse’s neck long enough? Is his head big enough? Gosh, I don’t know how to draw horses. I can never get the eyes right. Toss all of those thoughts out of your head and think about your lines and shapes and where they need to be on the painting. You’ll be surprised at how easily your drawing will appear. This method of drawing the image right onto the support will save so much time and energy for you. You don’t have to bother with drawing an image on paper or transferring it to canvas. It’s there on the painting as you go along. When you make a mistake on your drawing, dip your brush in some more paint and turpentine, and smear paint over the area you wish to correct. Dip your brush back into the turpentine and begin to find your image again. Keep the drawing light in color and you can paint over it and redraw it over and over until it looks right. When you grow used to this method, you’ll find it easier and easier to create each painting. I read many books on how to draw before I found one that made perfect sense to me. I didn’t like methods where I learned to draw circles, put the circles together and try to make them form the shape of a horse. I didn’t like other methods I found. Nothing seemed to work for me. Then I took a drawing class put on by an artist friend of mine. She used the Betty Edwards book “Drawing on the Right Side of the Brain”. It was like a light came on in my head! After I studied this method of learning to see, I could draw anything! Use value to your best advantage. Do you see the painting in the first white square below? It’s of a grazing horse. She has her head down, her tail is flying in the breeze. She’s a beautiful little horse! I suppose you think I’m crazy!? There’s no horse there? How do you know she isn’t white, in a blizzard, or covered with toilet paper? There are no clues to tell you what’s going on in this painting! All you can see are the edges. To give your audience a clue as to what’s happening in a painting, use the values of light and dark. If you want something to stand out, you have to put a darker or lighter value behind it or around it. Value is one of the most important tools an artist has for conveying a message. Now, when you look below this text, you can see a horse. I used a light background behind her. On the horse, you can see her muscles and her shape from the values I used. She has light highlights, medium tones and very dark tones to give her shape and let you see her form. We use value to show where the light is striking an object. Light rays come from a light source in straight lines. Lines in direct approach to an object create a highlight, the lightest point on your painting. In places where the light doesn’t reach an object, you have very dark shadows. As the surface of an object turns away from the light, you’ll have your medium tones. Another trick for creating a good painting, is to save your lightest color in a painting and place it next to your darkest color to create what’s called, the “center of interest”. The human eye will be drawn to that place as that is where the highest contrast is to be found. Choose which part of your painting will be most important, and place this center of interest there. Colors have value. But these values are relative to the strength of the color. Blue can have a full range of value, it can be so light, it’s almost white, it can be so dark, it’s almost black. Yellow has a relatively light value. It’s hard to make yellow become terribly dark. If you’re painting happily away, and stand back to look at your work, only to see nothing showing up…you know you have to change values around or on your object. A good way to see the values in your paintings is to stand back and squint at the work. If nothing there stands out at you, your values are weak. This is also one time when it’s good to be near sighted. Take off your glasses and stand back. If you see an image, you’ve done a good job of choosing values! To make an object stand out from it’s surroundings, there are two ways you can go. Either make your object lighter than the surroundings, or make it darker. Say you have a horse against a background of trees. Where ever your horse has a dark value, place a light value in the trees where it touches the dark value of the horse. Reverse this process when you have a light place on the horse. Place the darker value in the trees there. You’ll learn to do this instinctively the more paintings you create. Color plays a large part in how you want your paintings to look. Carpenter’s have hammers nails and boards. Mechanics have wrenches. Artists have their own little tool box. Color is my favorite tool. Value was my most important tool, for making my images stand out on the page, but it’s color that makes them sing. Color gives you the mood of your painting and sets the tone for how you want a viewer to feel when they view it. That’s right, as an artist, you have power, the power to make people feel emotions. Harmonious color is peaceful and calming. I’m using photos for this demonstration on harmonious color, along with some paintings I’ve done. 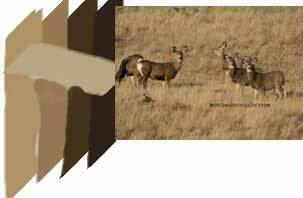 You can see in this photo of deer, the colors are basically all the same. Variations of light and dark, all different colors of brown. Artists will use a color scheme like this when they want to create something with a peaceful feel to it. Everything about this color scheme whispers to you. It’s beautiful in it’s simplicity and you love it for the serene, comfortable feel you get when you look at it. In this painting, The Beauty of Brown, I used harmonious colors. I created some drama with the addition of the backlight shining on the horses and by adding the black horse. In my original photo, that horse was a palomino. We can take artistic liberty with our reference photos. We don’t have to paint them exactly like we see them! If I’d left that horse his original color, I could have found a way to pull that painting off, but it would have felt differently than what I was wanting here. There’s a color theory that states, if your eye looks at certain colors together, your mind will form the color grey. Isn’t that weird? As weird as it may be, there’s something to it. Here are some examples, stare at blue and orange. There’s something about these two colors that you like. It’s because your mind is forming a sort of grey made from these colors. Blue and orange are complimentary to each other. They’re also directly across from each other on a color wheel. Purple and yellow, the same thing. Green and red, once again, complimentary colors. 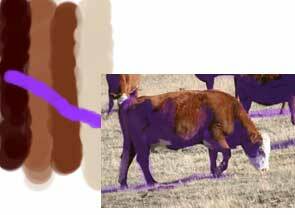 If I were to do a painting of this cow, using complimentary color, I first have to decide which color is going to be the compliment for brown. You could say this painting would call for blue as the cow might be more of an orangy brown than a yellow brown. But there are other factors in determining the over all process for complimentary color. The grass is a large part of this scene and it’s mostly yellow. As it happens, in this picture, purple is my chosen compliment to the painting. Notice the shadows under the cattle. Cameras create black shadows. The human eye sees color in shadows. You can make black shadows if you wish, or you can throw some color in them and make them sing. Just like the purple color does for this entire color scheme. In this painting, The Good Bay Mare, I used complimentary colors. For this painting, I chose green and red. You have to go by what you like, and how you want the painting to look. There are many variations on these color schemes. You can choose which greens and reds look best to you as you paint. Some artists like to plan their paintings out by doing tiny paintings ahead of time to see if the painting works. These are called thumbnail sketches. If you want to see how your painting will look ahead of time, do some of these, trying different color schemes as you go. Photoshop is a great tool for this also as you can see in the example above with the cow. If I start a painting and the color isn’t right, I adjust it as I go. Complimentary colors add zing to what can be a boring painting. You can get away with using them because God does it all the time! Our eye is used to seeing the glory of His complimentary colors. Look at the sun setting in a blue sky. Look at the red berries on a bush full of green leaves. I love complimentary colors because they are His colors. You are more used to dealing with rejection than you know. Every day life is full of it. You shrug it off and go on. But….all of a sudden you’ve done this painting. You poured your heart and soul into it. You agonized over the colors, the design and the subject matter. You spent hours getting it just right. Now you get brave enough to show it to someone. They say, “Oh, that’s nice.” And there’s kind of a funny look in their eyes as they walk off. You feel like the race horse who just got pulled from the race! Let’s take all these feelings you have and analyze them a bit. You did the painting because way down inside of you, there’s an artist. The artist in you, won’t let you live your life without creating paintings. You do it because this artist is there and he or she won’t be denied. This artist in you is feeling euphoric over what you’ve just done. So far so good, but there’s more to it. What I don’t think most of us realize is how much we paint for other people! The process of creating our paintings brings us such joy, we want to share those feelings with someone else! We don’t want them to choose our subject matter or how we want to portray it, we want them share the joy we feel in the creation of our work. I feel almost high when I first finish a painting. I could celebrate! I could dance! I could sing! I want someone else to feel as good as I do right now! So I show the painting to another person! It doesn’t make them feel good, it doesn’t make them want to sing and dance, it isn’t their creation…. That is the secret. So don’t be disappointed when you show someone your painting and they don’t feel the excitement you feel. Perhaps they have a child at home who’s sick. Maybe they just smashed their big toe and it hurts. They might be in a hurry to get to the bathroom. Who knows what’s going through the mind of this person you chose to be your audience. You just chose the wrong audience. You didn’t make a bad, worthless painting. For example, take a dollar bill and smash it up in your hands. Throw it on the floor and stomp on it. Rub it around until it’s dirty. Now take it to the store and buy a package of gum with it. It’s still worth what it was before you rejected it! You are the same euphoric artist you were before someone rejected your painting! I’ve found if you want someone who can honestly share these wonderful feelings you have when you first complete a painting, you almost have to share with another artist. Share that first glow of a completed painting with someone who goes through the same emotions, they’ll understand. I’m not talking marketing here, I’m talking about the magical joy of creation and the fun of spreading it around. My dad is a good art critic. He can look at one of my paintings and say, the ears are to short. The legs are to long. You used the wrong color in that mountain. He matter of factly looks at one of my paintings and immediately sees what I can do to make it better. He doesn’t say much, he doesn’t elaborate. He gets the job done. Any artist is glad for that kind of helpful critique of their work. My Robert is good at helping me with my artwork. He has ideas. He shares them with me. He doesn’t feel bad if I don’t use them all, he doesn’t stop helping me. He’s a good art critic. The more you paint, the more people who are exposed to your art, the more rank comments you will hear. There’s a design flaw in some brains. It’s called, “I might not have been able to create that, but I can sure tear it apart!” As an artist, you must develop a thick skin. When you hear a critique, recognize it. When you hear criticism, ignore it. Let’s say you’re sitting at an art show. You were juried in by 7 experts in your field of expertise. 20 artists were chosen to show their art at this show, and 500 were turned down by these 7 jurors. A person who’s attending the art show walks up to your booth and gives a cursory glance at your work. With a barely hidden sneer in their voice, they begin to tell you all about the paintings their dear old grandmother produces and how they’re far superior to your paintings. Don’t get mad, get even. Ask them in your very nicest voice, “Where are her paintings showing in this show, I’ll go visit them when I take a break.” They’ll probably be to dumb to know they’ve just been smeared, but you’ll have satisfaction! Turn downs from jurors. As you progress as an artist, you might wish to enter some juried shows. Don’t take the judges decisions personally. Jurors have many things to look at when selecting artwork for a show. They’re trying to present art as a whole that will show well together. You might have done a beautiful painting that doesn’t fit the exact theme of the show as well as some other painting does. These judges have tough decisions to make. If your painting doesn’t get into one show, and you believe it’s show quality, don’t hesitate to send slides of it off to other competitions. When a show juror sends you a critique, which a few of them do, take the comments to heart and use what the juror said to improve upon later paintings. Good honest critique will help you improve your skills. Recognize this tool and use it, you’ll become a better artist! If you don’t have a camera, find a way to get one! Once you have your basic camera, you’re ready to go forth and find pictures for your paintings. You don’t have to get the latest, fanciest, fastest camera there is. I’ve got great reference photos with a $40 digital camera from Shopko. What I want from a reference photo, is the idea for the painting. I like to do my composition with my camera. Nowadays, you’re ahead to get a digital camera. I paint directly from the image I see on my computer. I like the way the screen shines giving the image a light source that’s almost like natural light. I have a g4 mac, powerbook. I take it everywhere with me. I did a quick draw at an art show and used it there also. 2. Another way to use a reference photo. Extract the idea out of the photo. Use the basic information that’s in the photo, to create the best painting you can. I’m not saying you have to create a fantastic piece of art here. Just do the painting the best you can, using the skill level you’re in. Remove houses, take out unnecessary fences, edit the color information, put color into black camera caused shadows. Turn the horses around if you wish! This is my reference photo. This is the painting that came from it. I pulled the idea I saw in the photo out and painted it onto a support. I turned the Appaloosa white, I took the blaze off the sorrel. I think I liked the shape the white horse and the snow created. I also liked the shape of the darker horse as he connected the darker areas of the painting. There are two styles in these methods of using a reference photo. 1. Tight. Artist’s call this detailed way of painting tight. Some artists love to be captured in the details, they delight in painting each item they see and including everything. 2. Loose. Some artists love to paint loose. They let paint do what it wants, they let the image do what it wants. There is no right way to do this. Let your own style shine through in your work. If you love painting “tight”, paint that way. You’ll naturally shoot the photos you need for working in the method you choose. Same thing if you love to paint “loose”. You’ll find what you need in your reference shots. You might have noticed, my style is fairly “loose”. I like to lose every detail I can and still make a painting. I don’t want to have to paint every blade of grass if a squiggle can make you think there’s grass under a horse’s hooves. If I try to paint detail, I get so frustrated I want to scream. As you paint, your style will develop. The quality of your reference photos will grow along with your ability to paint what you see in your mind. The truer you stay to yourself and your vision, the better you will become. My design skills are so basic as to be nearly non existent. I’ll freely admit it. I think it’s one of my weakest points. Nevertheless, I’ll share what I think I know with you. You can tune up your skills as you go from other teachers, artists and trial and error. Now this is a weird, weird picture? Wouldn’t you say so? I know you say so! 🙂 But there’s a name for what this is, it’s called grouping. Group your lights and darks. Take your reference photo, and find a way to tie all the darks to each other and all the lights to each other. Think about putting a puzzle together. It latches together so all the pieces fit tightly against each other and if you pick it up, it locks and hangs together. That’s what you want your paintings to do…hang together! 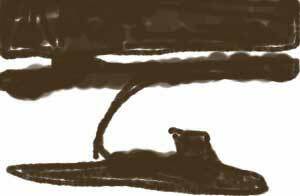 You also want to create some large exciting and weird shapes in your paintings. If someone is across a room from your painting, their eyes will pick up these shapes. The shape might draw them closer to have a better look at your painting! Along with this same idea, when you group your lights and darks, or middle values, try to give more weight to one or the other of these elements. This is called “dominance”. Let either the darks, lights, or middle values boss the painting. Choose one group and use it sparingly. This technique will give more excitement to your paintings. Use one of these elements more than the others. Give your viewers eye a nice big hefty shape to see the second their eyes light on one of your paintings. Look closely at this painting. You’ll see the shape from above in it’s design. The pieces of light and dark lock together. Now technically, you could say they don’t all lock, what I’m trying to explain here, is the concept that they do, and what that will do for your paintings. Another note about design. Don’t place two objects so their edges are close together or barely touching. This forms what is called a tangent. Overlap your objects so one appears to be firmly in place in front of the other object. This also helps give your painting a feeling of depth and space. Using a reference photo more than once. Just as you can take a comment from another person in many different ways, you can also use a reference photo in many ways! What you see in your reference photo can depend upon your mood or what’s happening in your day. For some reason, I see many things in this reference photo. 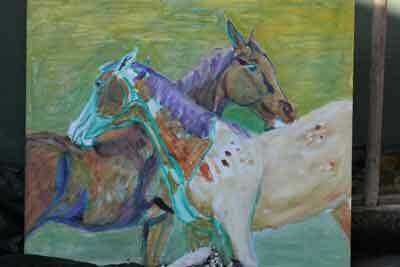 I’ve begun to paint from it several times, each time, I had chosen to paint the relationship between these two horses! I’ll show you below here, the paintings resulting from my efforts. All three of these paintings are completely different. In fact, I’ve done one other painting from this photo, but I don’t think I scanned it before I sold it. If you’re short on reference photos, don’t be afraid to find different works of art in the same photo! I’ve turned to this photo so many times when I’m looking to start a new painting. Maybe one of these days, I’ll get both of these horses in my painting! In posting these lessons, I’m not suggesting I know everything about painting. My purpose here, is to perhaps help someone to become a better artist, or to lose their fear of trying to become a better artist. If you can learn anything that helps you on your journey, I’m happy with the work I’ve done in creating these lessons. I will be posting more as more ideas come my way. Click here to email me if these lessons have helped you, if you want me to cover a different subject, or if you’d like to ask me a question…Donna. If you enjoyed this information, please do take a moment to drop Donna an email and let her know. Be sure to also visit her website and check out her awesome artwork.